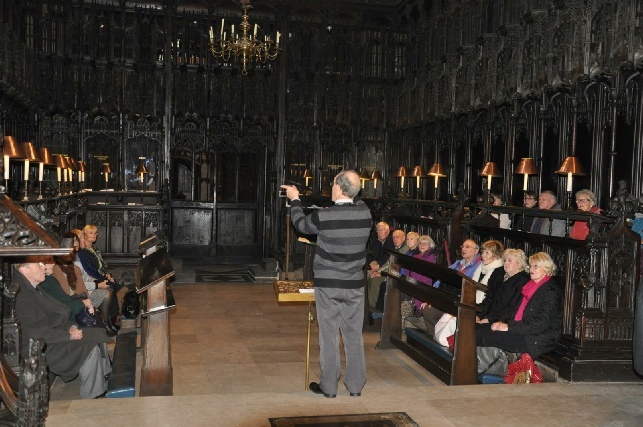 Our tour around the Cathedral was well supported by our Members. We were split into two groups with very knowledgeable Guides. The Cathedral needs £2,880 per day for running costs. In 1940 the Cathedral suffered the worst wartime damage of any UK cathedral after Coventry. It was in 1421 when Henry V granted a Charter to build a collegiate church, in 1595, John Dee was made Warden and in 1787 the church hosted the first mass meeting in the campaign to abolish the slave trade. Nowadays, the Cathedral holds many talks, concerts, recitals, family activities and has conference facilities. Some of us ended the day in the quirky Propertea for tea coffee and cakes which is part of their visitor centre.